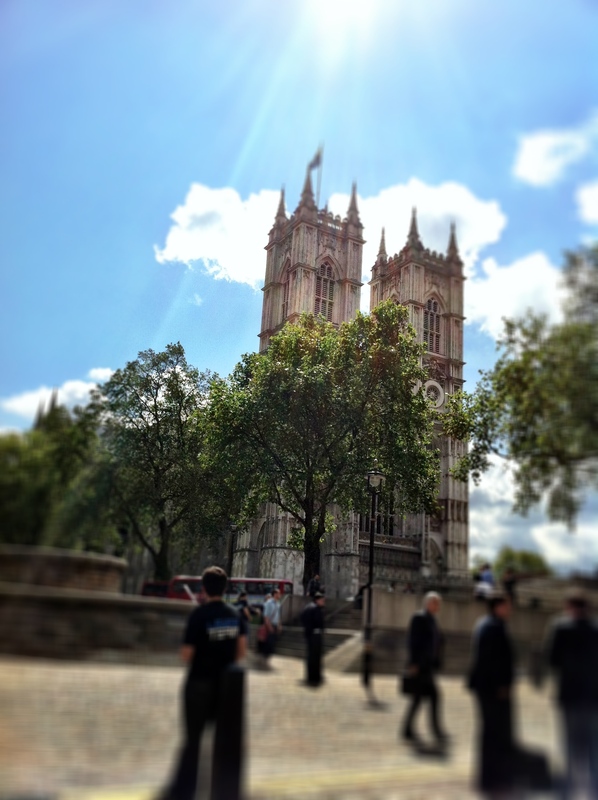 This remains one of my favourite photos I’ve ever taken with my trusty iPhone. it was from our Godalming Food Festival in 2010. 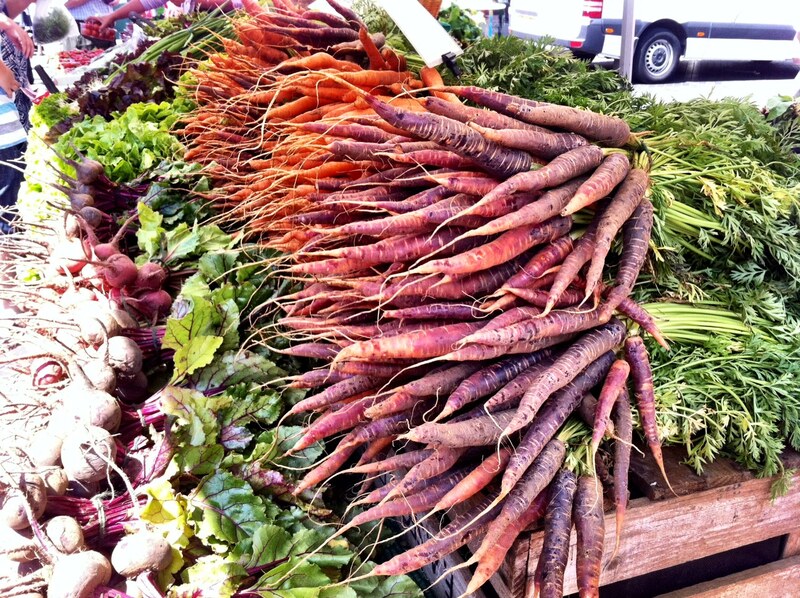 It’s what I associate with being out in the country and having access to some of the best Farmer’s Markets around. It was long overdue but it really needed to be done, and what better way to make sure I stayed off my broken foot then to finally finish the blog clean up I started a few weeks ago. It’s taken me almost a month to do so, not just because of the accidents and distractions but because I discovered I had far more recipes to catalogue than I’d realised. It’s my own fault really – I should have been doing this as I went along but admin isn’t one of my stronger points. 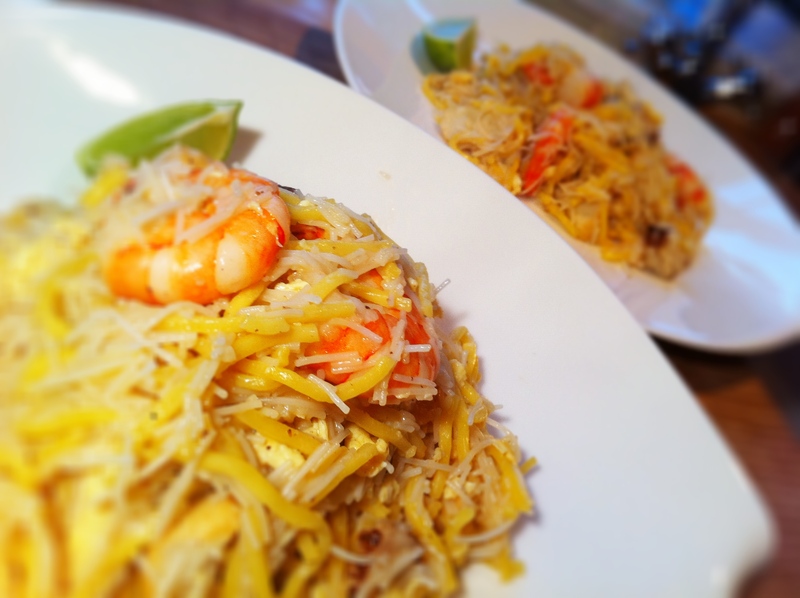 I haven’t changed the actual template of thebigfatnoodle but I have categorised my recipes so I hope you’ll all find it much easier to navigate and explore. I’ve got some ideas for new sections but that’ll have to wait until I’m back from our upcoming trip. Looking back over the 15 odd months of posts, I’m generally quite pleased with what I’ve done. I’m not one to blow my own trumpet but I am really quite proud of some of my recipes. I’ve become a better cook as a result of cooking more things from scratch but I’ve also learnt a hell of a lot from my fellow bloggers – you are all a constant source of inspiration! Now that I’ve finished my big spring clean, my husband and I are taking ourselves off on our first loooooong-ish holiday in a while. We’re off to Vancouver for a week before starting what I hope will be a fun-filled driving holiday from Seattle to San Francisco, with pit stops in Mount Hood, through the Redwood Forests, along the coast and into Sonoma (wine country!) before finally arriving in San Francisco for some frolicking with friends before we return home. Sadly, I won’t be able to do quite a few things because of the ol’ storm trooper boot I’m still wearing but at least I’ll have more space since I’m only packing one shoe for my left leg. Let’s hope my inflatable cast is up to all the sightseeing we’ve planned. It’s only fitting that I start with one of my all-time favourite pork dishes – my hawker-style roast belly pork. One of the reasons I started this blog stemmed from having to recreate some of the street food I grew up eating in South-east Asia. You can find this roasted belly pork in any number of Chinese restaurants in London’s chinatown but as I now longer live in London, I make this myself. 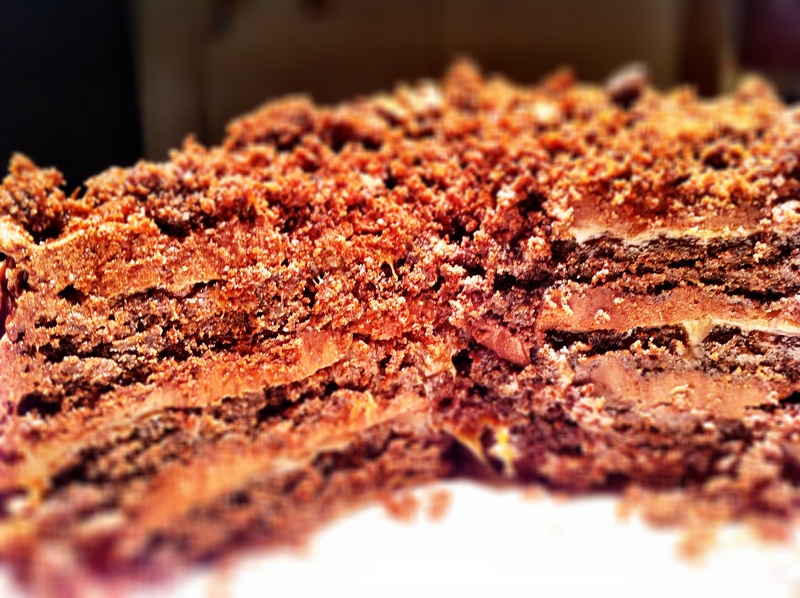 It is so, so easy to make and my mouth is watering just thinking about it! 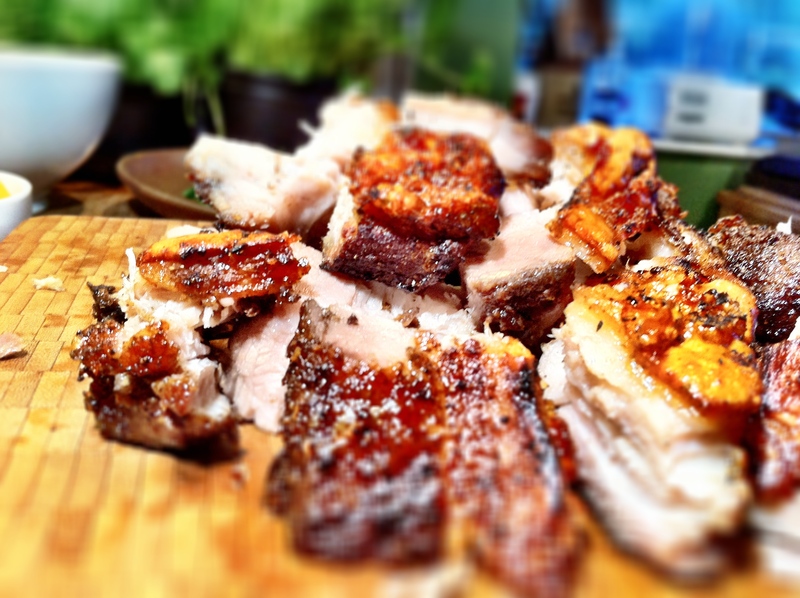 Hawker-style roast pork. This really is my favourite way to eat pork. 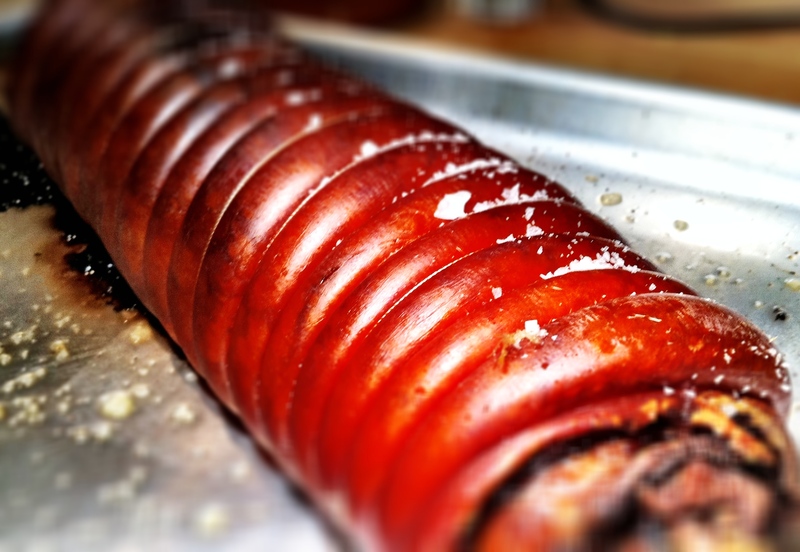 Slow roasted at a very low temperature for a few hours ensures perfect, crispy crackling every time. Still on pork belly (it is my favourite cut)… I also posted a recipe for a slow-roasted rolled belly pork with a sage, onion and cranberry stuffing. This rolled pork belly makes a reappearance at our dining room table every time we have a lot of people to feed because it’s so economical too. Slow cooked rolled roasted pork with a sage, cranberry and bacon stuffing. You can actually see right through the crackling, that’s how much the fat has rendered off it. 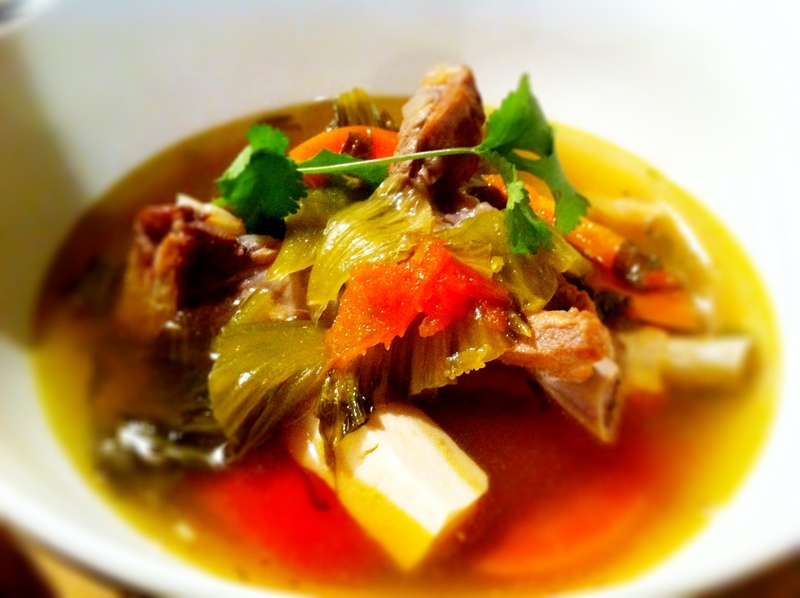 Spare rib and mustard greens soup – my favourite Chinese soup. Thankfully, not all of my pork recipes are lardy; there are healthier ways of having it too, and this pork rib and mustard green soup is one I will never, ever get sick of eating. Its worth whatever trip you have to make to find a Chinese grocery store that sells pickled mustard greens. It’s very common in Chinese cooking to cook pork with seafood too, and two Hawker style noodle dishes I’ve had to teach myself to cook combines pork with either prawns or other seafood too. 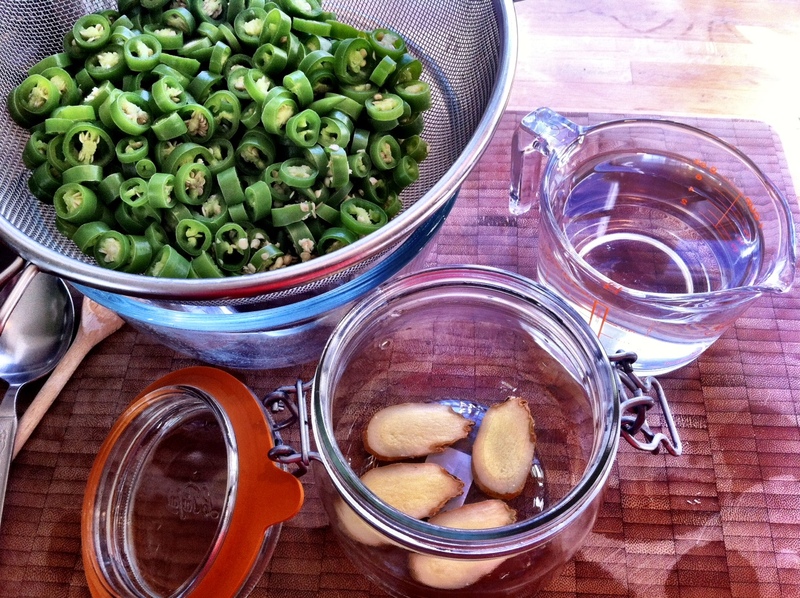 I pickle my own green chillies in fresh ginger and chinese rice wine vinegar. If you’ve ever wanted to cook a noodle dish to impress any of your Chinese friends with, I don’t think you can go wrong with either one of these – Singapore style Hokkien mee, and fried mah mee. It looks quite plain but this Singaporean hokkien mee is to die for!!! 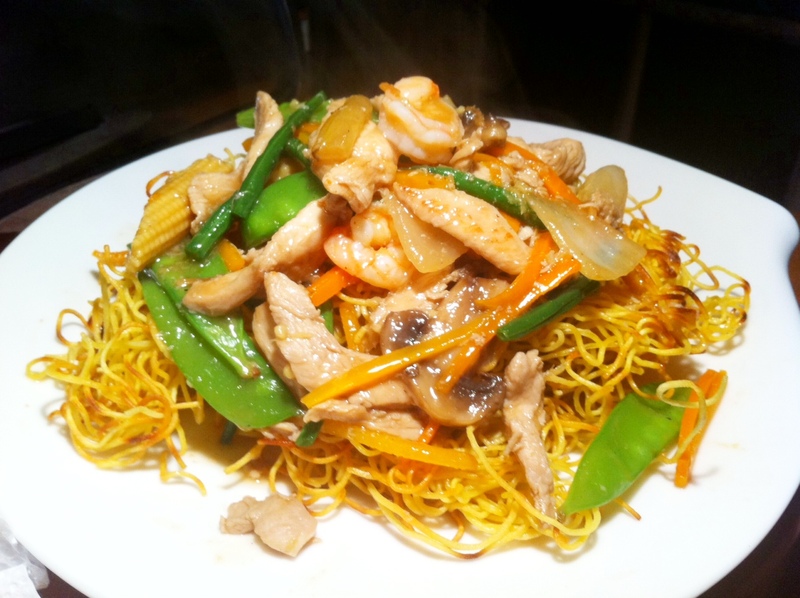 Crispy noodles covered in crunchy vegetables in a lovely, glossy sauce – everything made from scratch again to recreate the hawker street flavours I no longer have access to. Stir fried green beans cooked the way I know best. Simple. Clean. Nourishing. 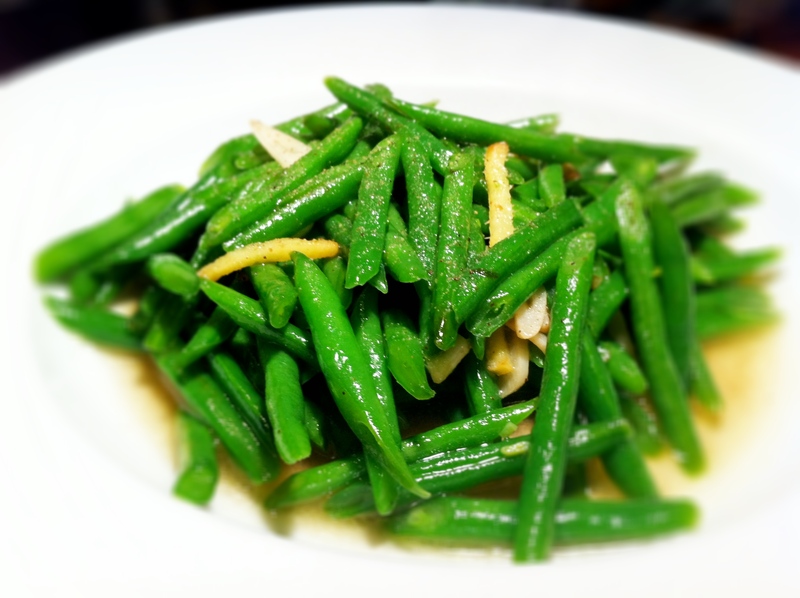 … and you can’t get much healthier than simply stir-fried green beans or vegetables. Whenever I make this, I always think of my mum. After all, she was the one that first taught me how to cook them this way. 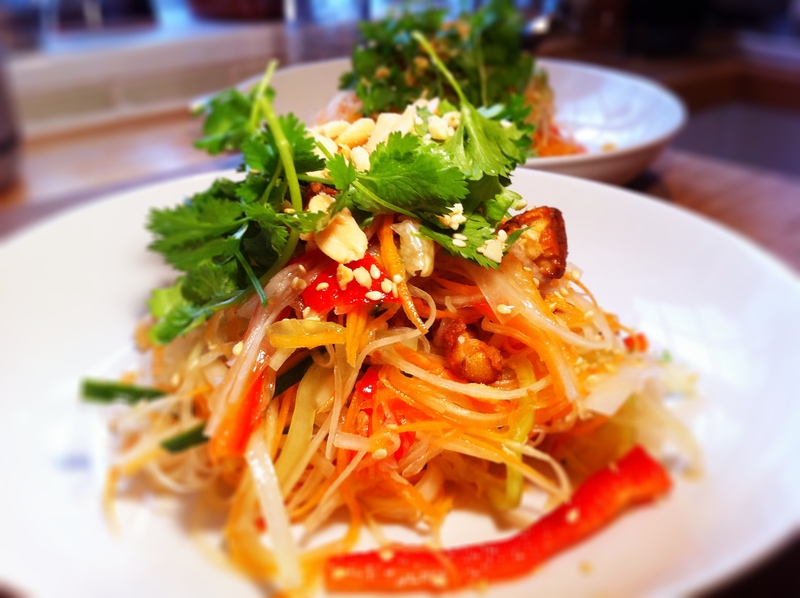 So often I find inspiration from Asia whenever I’m in need of what I call cleansing food, when I feel the need to keep things as raw and wholesome as possible, and my go-to recipe when this happens is this Thai salad with fresh green papaya. 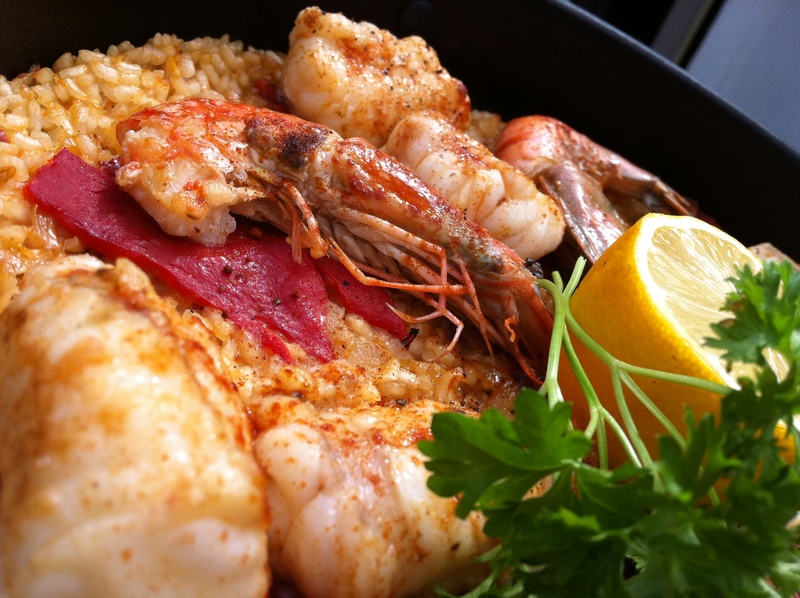 It’s hot, sour, spicy, sweet and savoury and perfect when you’re looking more something you can feel good about eating. What I have discovered however is that when I decide not to cook vegetables Chinese-style, I gravitate towards Italian/Mediterranean flavours. 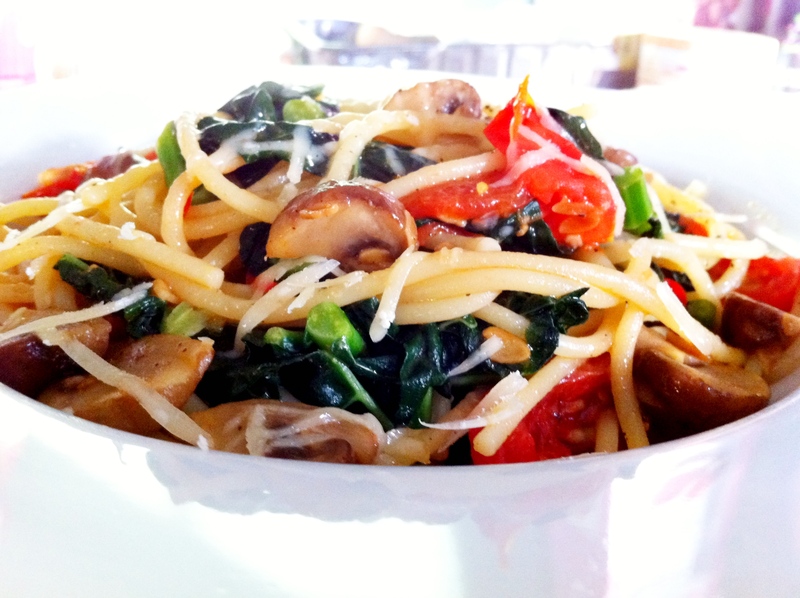 This spicy vegetarian pasta, though simple, is one of the dishes that I am most proud of. 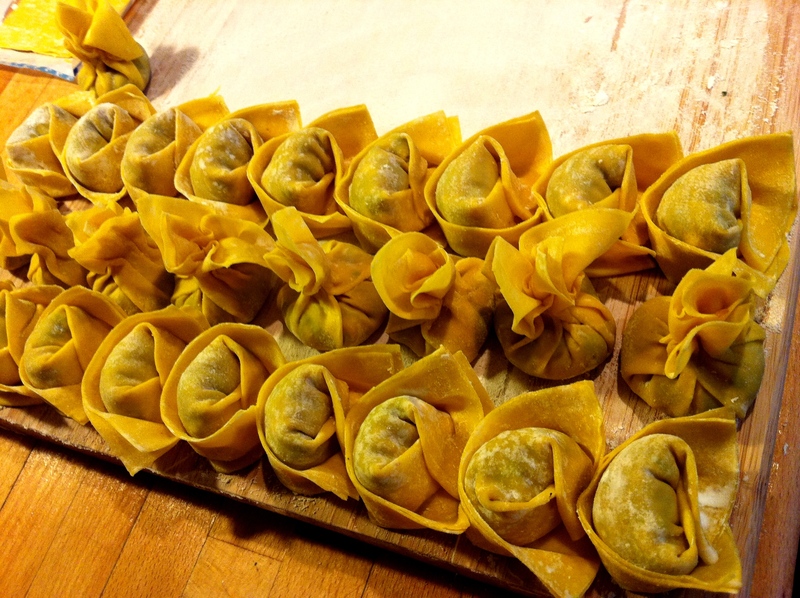 It’s packed with flavour and I have no qualms making this again and again because I know it’s packed full of goodness! I’ve surprised myself with the number of meat free meals I’ve actually made and this spicy vegetarian pasta is one I’m particularly proud of. 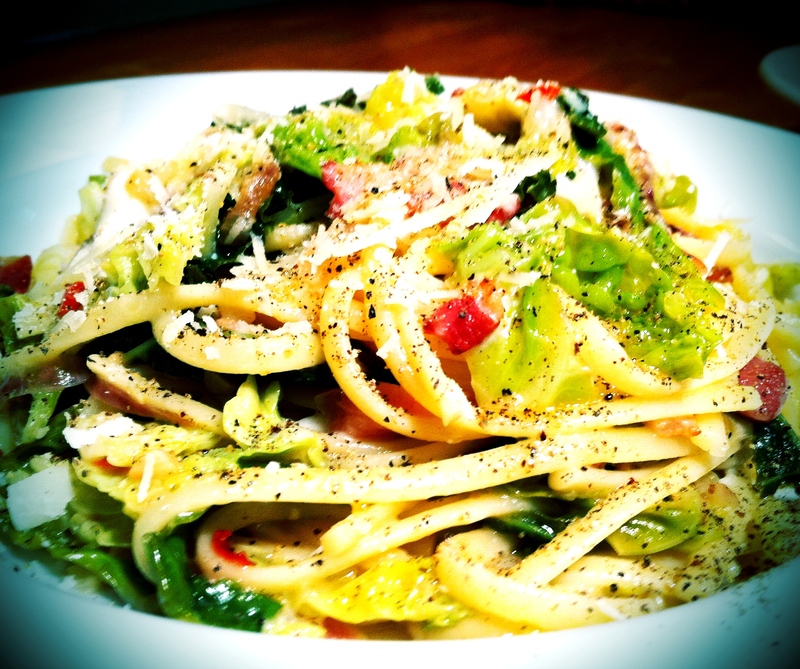 I also make this lemon savoy cabbage linguini with bacon and parmesan A LOT! 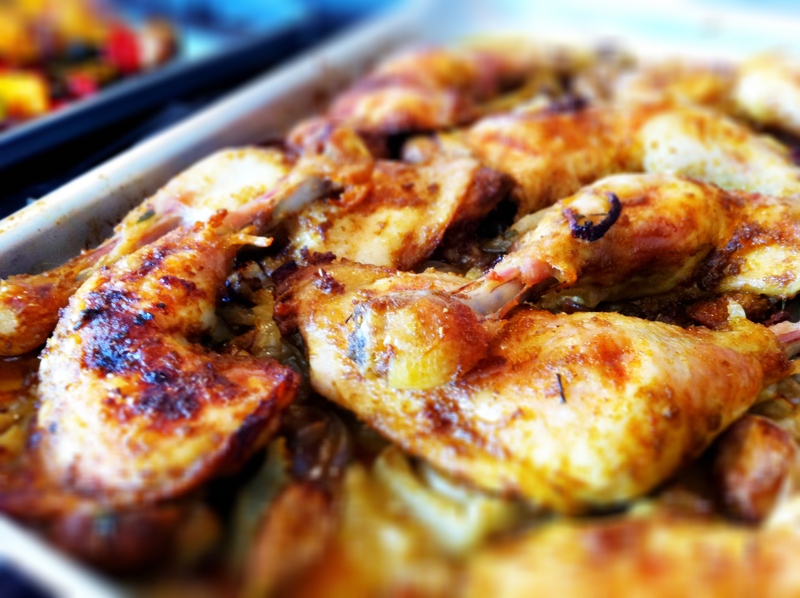 It was originally adapted from a Jamie Oliver recipe but I have made it my own now, as have my friends and family. And if there’s one Italian ingredient that I know most of use wouldn’t be able to live without, it’s extra virgin olive oil. EVOO, plus a good balsamic vinegar and parmesan, is all I really need to take a simple salad and turn it into something special. I’ve created three salads this year that I genuinely adore eating, starting first with this fig, ham and mozzarella salad that I created totally by fluke. I have to admit that I simply adore putting fruit in salads; I have a naturally sweet tooth and the additional colour fruit brings to a salad also helps make it look so pretty and appetising. 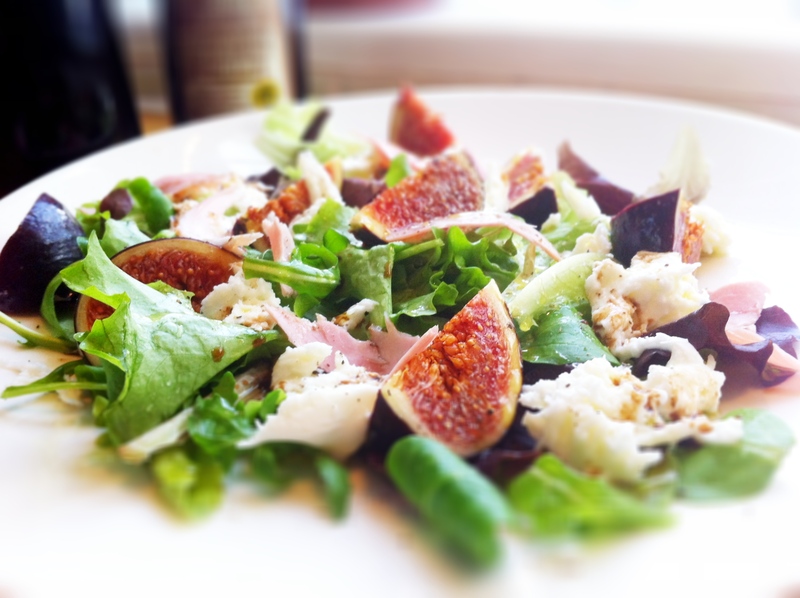 Fig, ham and mozzarella salad. Great for lunch. Great for dinner. 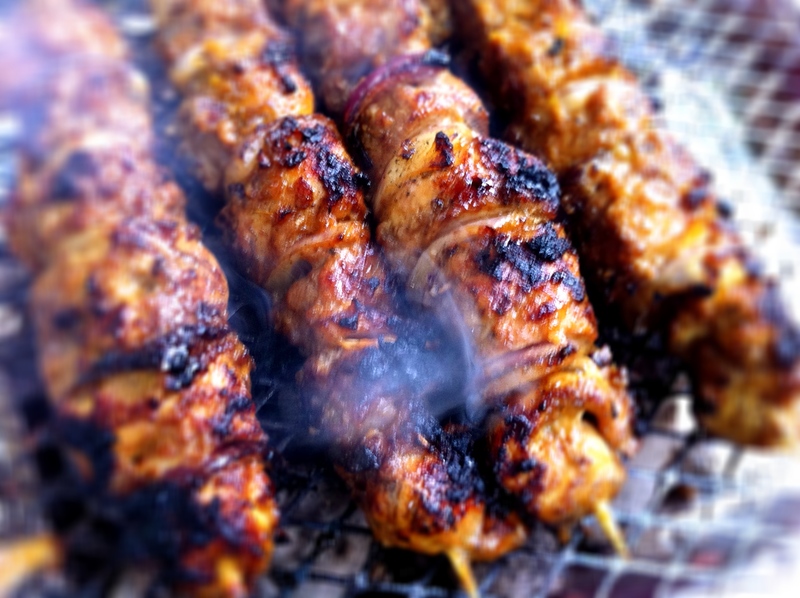 Chicken satay – proper Southeast-Asian style! But nothing, and I really think nothing, is more appetising than the smell of a good BBQ or grill! 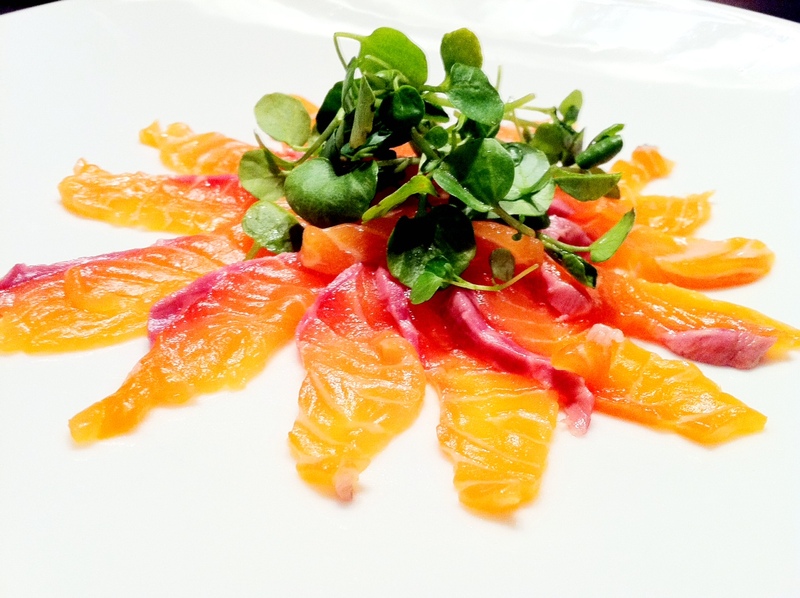 Salmon carpaccio before the zingy lime and ponzu marinade is poured over it. Again, harking back to my love of Asian street food, I’ve learnt how to recreate the true flavours of proper, southeast-Asian satay. Cooking for friends and family is a theme you’ll probably find running through most of my recipes. It’s what I love to do. Nothing gives me greater pleasure than providing nourishment to the ones I love. But while I love cooking for people, I’m really not into the whole fancy dinner set-up; I’m into sharing plates, which is again very much in my Chinese pysche because Chinese dinners are all about sitting around the dining room table with everyone tucking into a variety of dishes. This salmon carpaccio starter, roasted curried chicken with fennel, and chocolate pavlova have become staples when cooking for many. 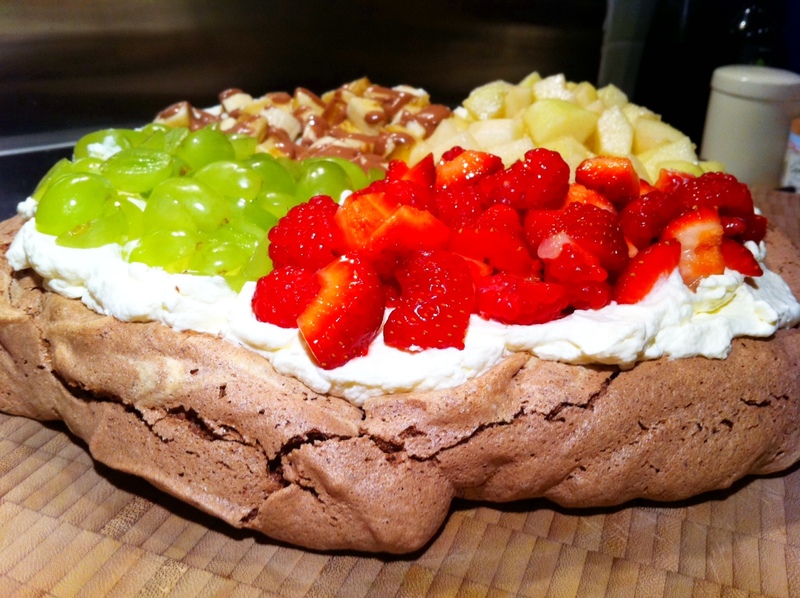 Quattro frutti chocolate pavlova. Yum. Anyway, I’d better stop here now because I seriously need to finish packing for my trip, and I’ve made myself so hungry that I’m off to the kitchen to hunt down something to eat. Sadly, we’ve been running our fridge and freezer down before the trip so I’m probably going to end up going hungry! I don’t know if I’ll be able to post while I’m away so if I don’t, see you in roughly 3 week’s time after I return from what I’m calling my big Canadian-American adventure. We are finally revelling in a week of super-hot, deliciously sunny weather in the UK though one never knows how long the warm spell will last in this country. 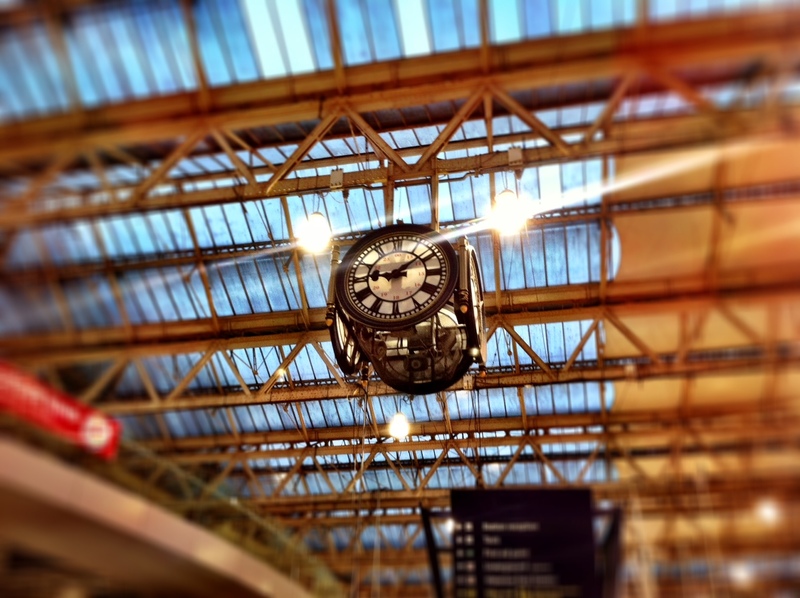 I’ll leave you with a picture I took of Westminster Abbey in the blazing sunshine and a shot I took of the clock in Waterloo station – I pass it twice daily and it’s been so nice being able to take a photo of it against a blue sky compared to the usual grey and cloudy backdrop. For those of you in the UK, I hope the weather stays this brilliantly warm and sunny. For everyone else, I hope it’s lovely wherever you are as well. See you in 3 week’s time! It is really amazing how much blogging changes the way you do things, isn’t it? I just got back from Vancouver myself and it was beautiful as always. I also did that road trip that you have planned when I was about 9 years old, though we made it all the way down to San Diego and back. I hope you have a great time! 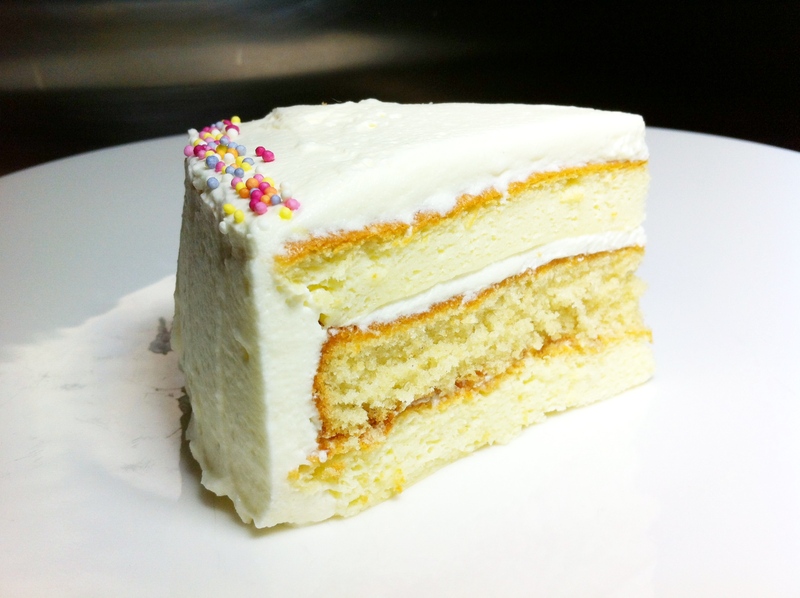 Love this – I totally understand why your hummingbird cake is your most visited post – the picture alone is worth checking out! Have a glorious vacation; sounds devine! Have a glorious vacation and eat some special treats along the way. AND get the recipes, please! I do hope you have a wonderful holiday, and enjoy Vancouver, it is indeed a beautiful city. I hope you get a chance to take a trip up to Whistler, and definitely try the Peak to Peak lift. Whistler is great even in the summer. You do cook some incredible food, Noodle! Enjoy the holiday! Lovely images of some great looking food, and I know what you mean about procrastinating on spring cleaning…I was doing some just a few moments ago, then decided I’d rather read other people’s posts! What a treat – a great way to catch up 🙂 Enjoy your trip! Above all your roasted pork is beautiful, really gorgeous. 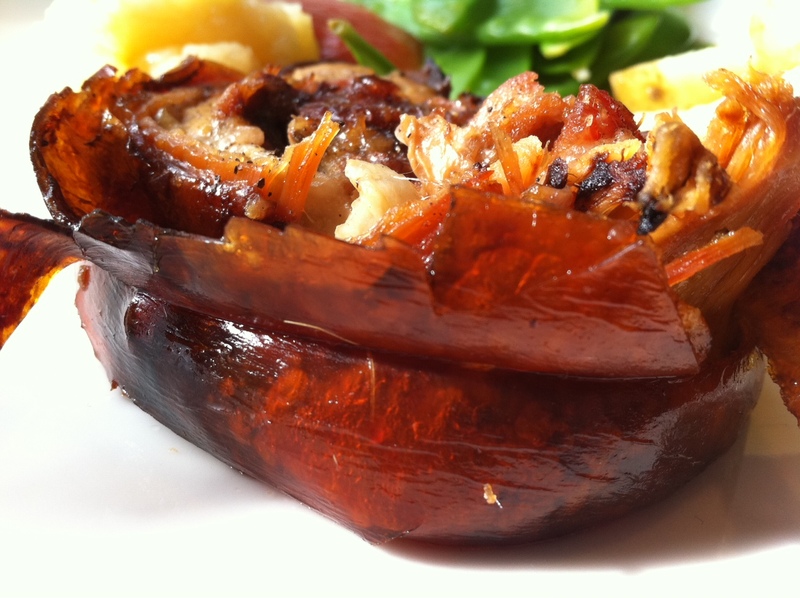 I am a fan of slow, juicy roasted pork so your photos are making me salivate as I write this. Nice post all round. Anyway, while you’re in SF do check out the bakery Tartine, I think you’d love it (I have both the cookbooks and they’re indispensable). 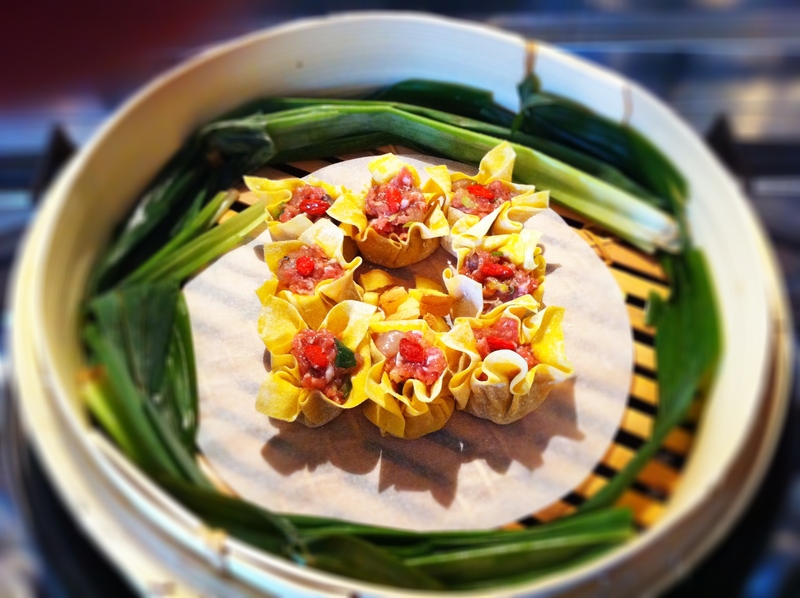 Also, I haven’t been to SF since I was a baby, but I hear their dim sum/dian xin is some of the best in the world. Omigosh, I may have to go down for an early lunch after looking at all your photos! If Maine is on your travel agenda, you must let me know. What a great post. I want it all! A great idea for a post – part retrospective and part celebration and clear up, love it! Happy holidays. And I need to remind myself how you cook the green beans, as it’s nearly the season here ! Joy! !